Popularity of Blogs can be derived from the number of times someone reads an article. Another way to measure your popularity is to count the number of times somebody made an url-link to your blog. You can measure your score with the "link:"-feature of Google (link:<url>). In my case, my 3 weeks old blog has a score of zero. The next Question is: How Popular is Your Blog in comparison with Others? The nice thing about the "link:"-feature of Google is the possibility to measure it for other blogs as well. You can measure the link popularity for any blog you want. As a newcomer in the Testing Blog World it is very interesting to know what the most Popular Testing Blogs are. So I did some research.....collected a list of Testing Blogs......made a little job to get the Google score.........and Voila : I know what (today) the most popular Testing Blogs (from my list) are! Interested? I made a tag cloud at http://robkuijt.nl/testingblogs (also on the right behind "More Testing Blogs..."). Do you want a Testing Blog in/out my list? Give a comment on this entry and I'll change my list next time I perform the measurement. In the nearly 30 years I am working in the ICT world, I've seldom met someone who deliberately made errors to annoy his contractor, manager or whoever�. Everybody I met, made his or her best effort to do their job as good as possible! Nevertheless it is obvious that after joining the individual parts, their (and also mine) team efforts mostly aren�t good enough. Lack of Quality is a costly and sometimes even a lethal problem. I think it is strange that, one ICT-assignment parallel given to, let's say, 20 individuals, results in many different outcomes; the change that their work has the same outcome is practically NILL! And another thing I am amazed about: If you ask those 20 individuals, whether they are certain about the quality of their work. Mostly they can�t predict the results of the connecting test or review at all. Most of the time you get answers like: "I hope I did well" or "I think they won't find too many errors". I'm glad my dentist, my general practitioner or car mechanic don't work the same way!! I think, if you look at the way the individual, in general, is doing his work in the ICT industry, huge improvements can be made, by investing in baby steps! Assuming that nobody wants to deliver crap: how can I help an individual (let's call him Mr. A) to do his work the right way? Simple Rule 1: The Assignment for the individual must be SMARTER. A SMARTER objective is one that is Specific, Measurable, Achievable, Relevant, Time-bound, Evaluated and Rewarding. The assignment must give ALL the information that is needed to do the job the Right Way the First Time. Including the required knowledge and experience, the reference to the instructions for the techniques and tools, the acceptance criteria (a mandatory list with quality checks), and a contact for asking questions (obligatorily documented; for instance by e-mail). Before Mr. A starts his assignment he MUST know exactly what he must do to complete the job and gets his applause. It is very important that Mr. A realizes that only he can judge if the assignment is SMARTER "enough". Simple Rule 2: Prevent Mr. A to do the best he can! Good is good enough! An assignment concerning Functionality, Time, Money and Quality must be in balance! It must be clear at the start what must be done if the balance is disturbed! Simple Rule 3: Fight the biggest enemies of Quality: Assumptions and Interpretations. First, we must Mr. A help to make the correct interpretations, so it is very important to give a proper kick-off. If Mr. A doesn't know how the product, he is creating, will be used, he never can make the right interpretations. Second, Mr. A must learn to ask questions when he is not exactly sure about the choices he has to make during his activity. Simple Rule 4: Delivery must be done in a way that Mr. A is forced to know the quality of his product. Delivery can only be allowed if the product is compliant to the exit criteria. Mr. A must make a statement; he did perform the complete set of quality-checks (exit criteria). Simple Rule 5: Feedback must be done in a way Mr. A can learn from his mistakes. If in a later stage an error has been found, feedback must be given in two ways. First to create the learning cycle, Mr. A must give, after analyzing the problem, an explanation why the error has slipped through his own detection. Second, of course, the error must be corrected. I'm curious.... Can 5 Simple Rules affect the ICT Quality problem? In other words: Can 5 Simple Rules make the ICT world stop running.... to learn baby steps? but always time to do IT over! I'm living in 2 Worlds. In one world I'm working with Developers, trying to let them build software at a quality level the application user wants. In the other world, at the other side of a "Wall", I am coaching Generalist Testers to do their job as good and efficient as possible. Yes, my two worlds are separated by a fictitious Wall. The Challenge: Developers and Generalist Testers, each at one side of the wall, don't make efforts to understand or help each other. In the T-world we don't hate the Developers for their perceptions. We are disappointed about the poor quality of the software. Bad assumptions on the part of Developers are more to blame for the problems than are software weaknesses. We never(or seldom) get software what will work right the first time. No, in the T-world we think that developers forget for whom they are building software, it looks like they are building for themselves......On the other hand we, Generalist Testers, realize that the Developers seldom get the time to do it right, but always get the time to do it over....But why are some errors made over and over and over again? The Walls between Developers and Testers do exist for many years now. And probably there are good reasons to go on like this..... but in my opinion there are more reasons for tearing down those Walls. DEVELOPERS AND TESTERS NEED EACH OTHER TO DELIVER THE PROPER QUALITY!! I like living in 2 Worlds, but I love it when Developers and Testers collaborate. Hello World! This is my first Entry ever! I am Rob Kuijt , I like developing software and I enjoy testing it as well. In this blog I will share my experiences and ideas with everyone who is interested. A little background: I started in the early 80's as a Fortran-Developer in one of the Academic Hospitals in the Netherlands. After a career as Designer and Project leader, I started as a Functional Auditor at Software Control Nederland BV (later part of Sogeti). In the early 90's I participated in the development of TMap� (Test Management Approach of Sogeti). 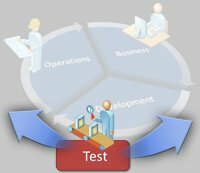 Within Sogeti I am specialized in the area of Development tests (I've written a chapter about it in TMap� Next) and Managed Testing Services. Tomorrow I will introduce you to a big enemy of quality: the Wall between Developers and Generalist Testers.